Home › Toys › Flipazoo The 16 Pillow With 2 Sides Of Fun For Everyone Each Huggable Flipaz.. Stuffed FlipaZoo Toy Pillow is Safe, Washable & Available in Array of Characters & Sizes for All Tastes. Size:Dragon / Unicorn Two sides of funfor everyone! With a FlipaZoo ToyPillow, kids will flip for their lovable animal friends! 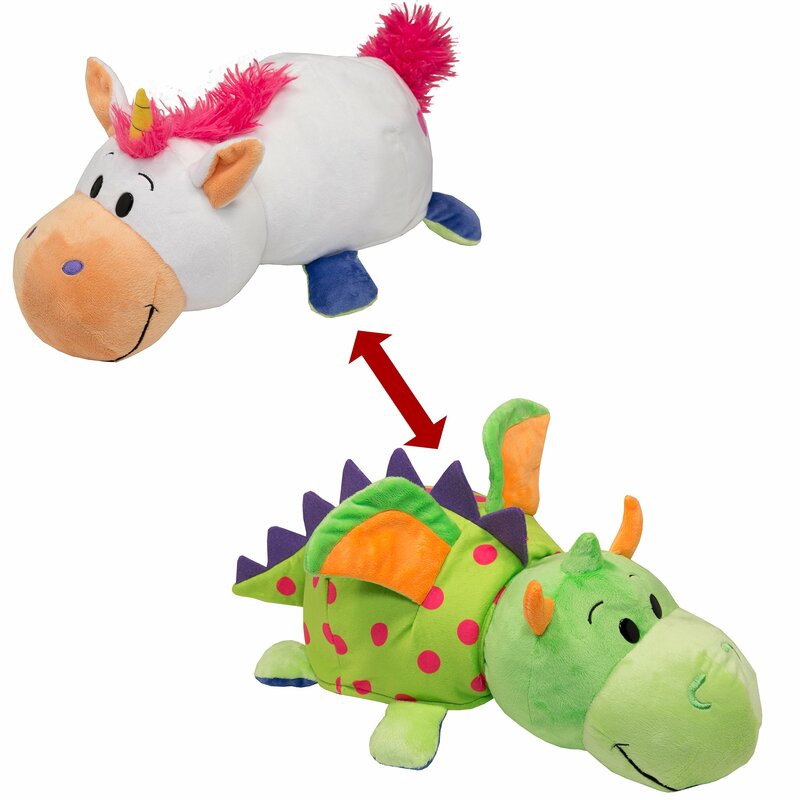 Each fun-stuffedFLipaZoo features 2 fluffy characters that flip back and forth for 2 sides offun. FlipaZoo is simple and easy to do. Discover the complete FlipaZoocollection for a variety of characters, colors and sizes that are great foron-the-go home. People of all ages will love collecting, FlipaZoo friends, oneby two! A jungle of fun! FlipaZoo s charming 2-in-1 design allows children toflip from one character to another as they play, snuggle, sleep and share.Choose from a vast selection of FlipaZoo characters in styles and colors tomatch every personality. Double the hugs. With a one-of-a-kind hold and flipdesign, tykes easily grip their buddy, flip the soft back, and reveal a newplaymate. Its a great two in one companion for both a comforting snooze or anexciting playtime partner. For snuggly sensation. The FlipaZoo doubles as asoft pillow. Make FlipaZoo the perfect travel friend for your little travelbuddy. Not one, But 2 friends to snuggle in bed, in the car, or whenever theyneed a little down time after a long play date with friends. Each FlipaZoo issoft and safe enough for kids of most ages. Collect em all! FlipaZoosassortment of characters is the hottest trend in plush collectibles. Kids ofall ages will love flipping and displaying their FlipaZoo collection. FlipaZoowill provide hours of entertainment and creative playtime. A New All TimeFavorite! Kids personalities transform as quickly as their shoe sizes.FlipaZoo brings variety and interest no matter their mood: This easy to usepillow toy makes a favorite companion they will cherish for years. Gift themfor birthdays, holidays, and more! Youll Flip for Them! Theyll Flip for You!Collect em all!